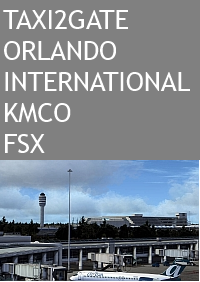 Is an international airport 6 miles southeast of Orlando. 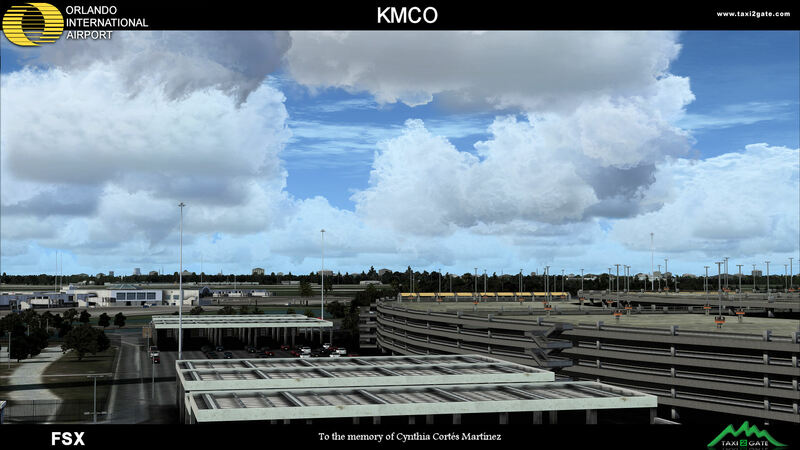 It is the second-busiest airport in the state of Florida, after Miami International Airport, the 13th-busiest airport in the United States and the 29th-busiest airport in the world by passenger traffic. 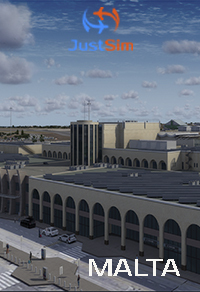 The airport is a focus city for Southwest Airlines and JetBlue Airways. Southwest is the airport's largest carrier by passengers carried. 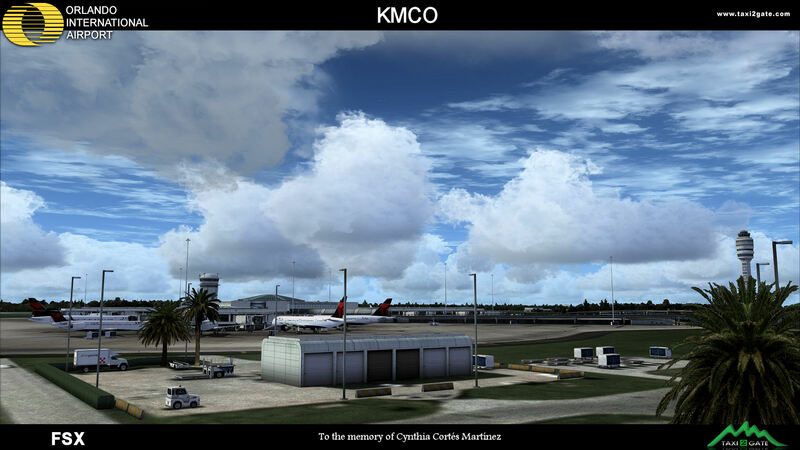 The airport also is a major international gateway for the mid Florida region, with flights by foreign air carriers. 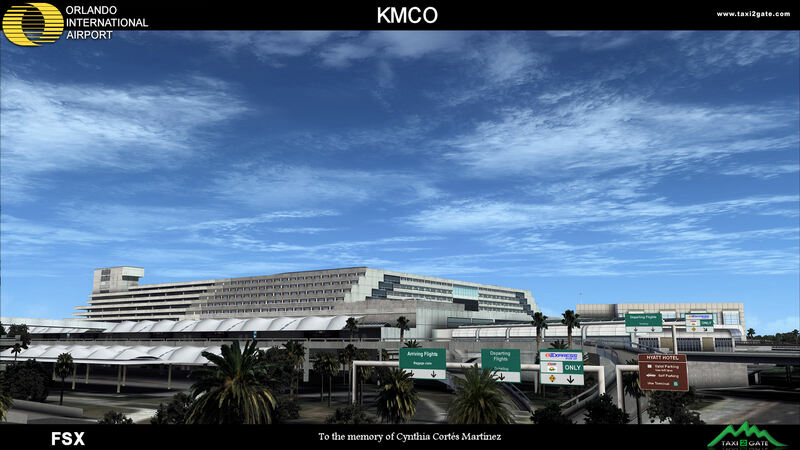 The airport code MCO stands for the airport's former name, McCoy Air Force Base, a Strategic Air Command (SAC) installation. 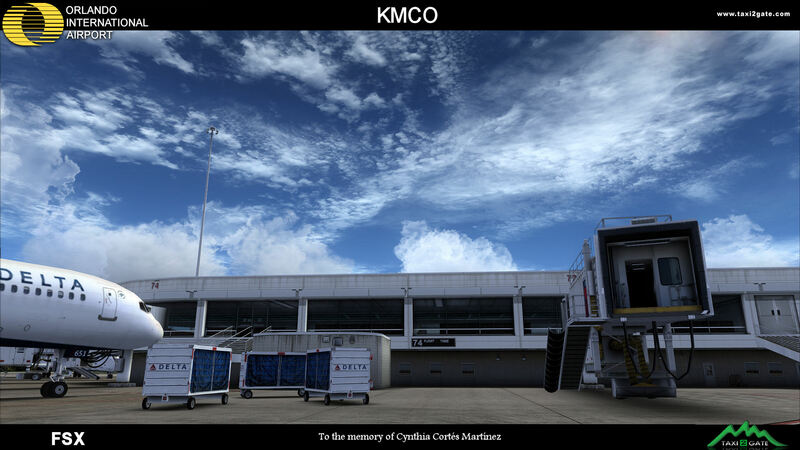 Works perfectly fine in 4.4, and aside from having to delete a file in P3D to eliminate taxisigns in the wrong places (problem with P3D, not the developer), this is a lovely airport to utilize. Wouldn't think twice about buying it again if I had to. 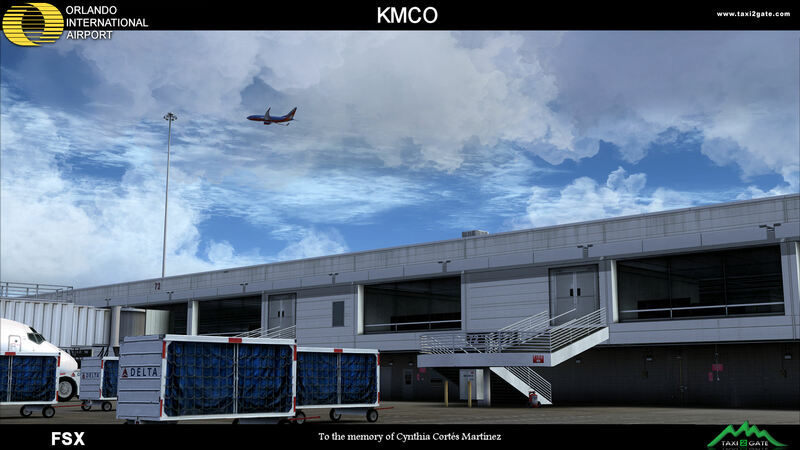 Beautiful airport scenery. Good on frames. 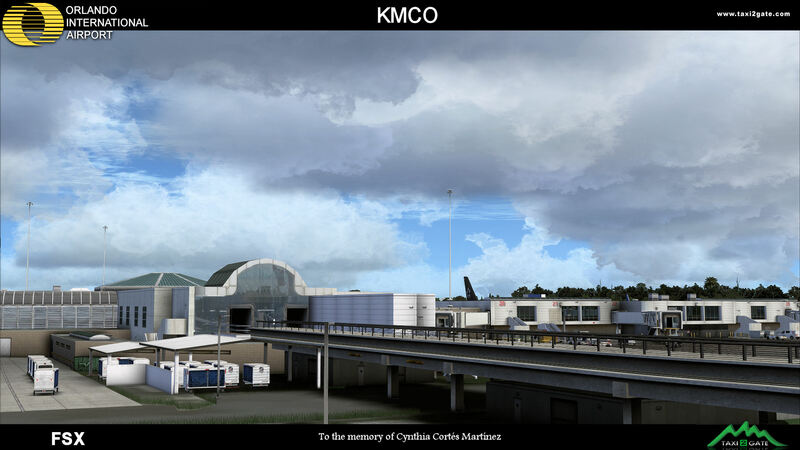 Lots of detail including aircraft bridges and moving monorails to the airsides. Lots of good detail. This airport is outstanding! 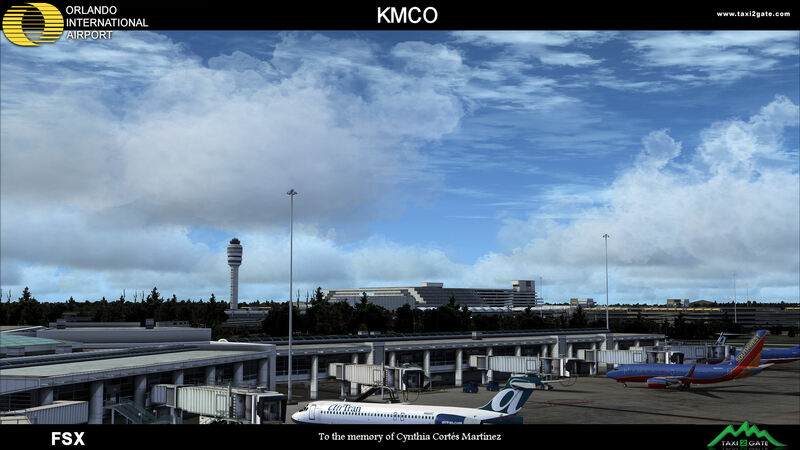 I was using this scenery in FSX and I have now upgraded to P3D v4.3 and i'm pleased to say that it works without issues, despite not being upgraded yet by Taxi2Gate. Incredibly detailed airport. 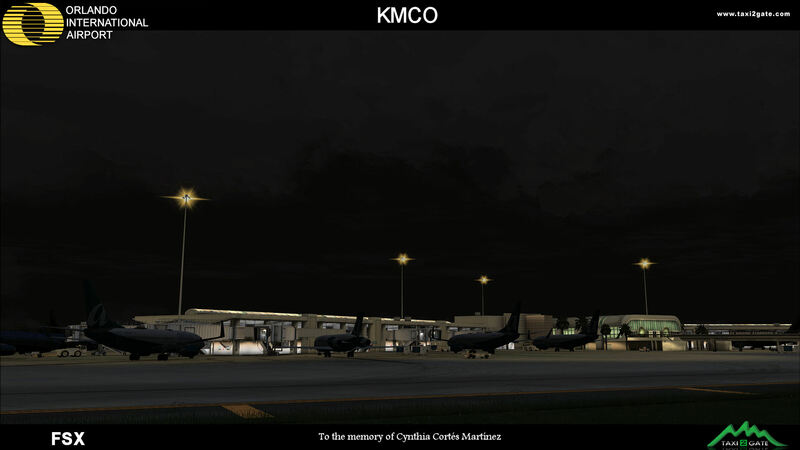 Taxi2Gate's airport addon's are always outstanding! 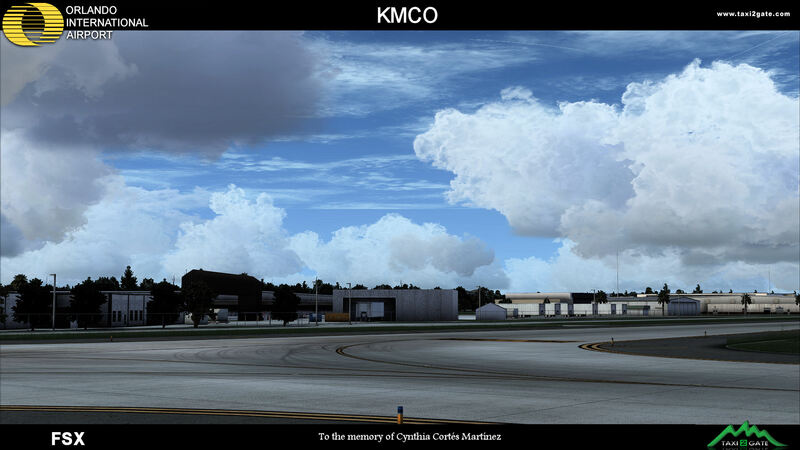 I live very close to KMCO and I often go there to do some plane spotting. 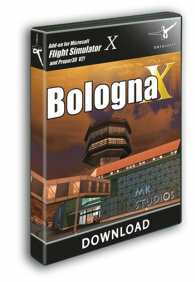 I have downloaded this add on for my FSX:SE and I have to honestly say this is the best add on I have downloaded in a very long time. The level of detail on this scenery is amazing. I am very happy with my purchase. 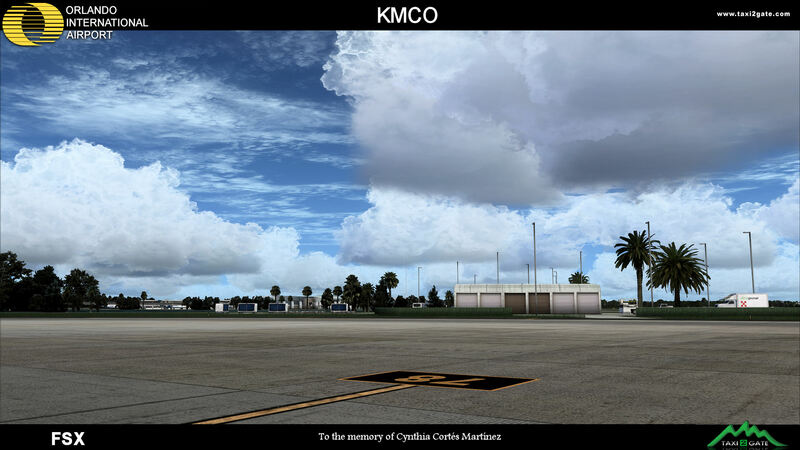 The level of realism to the surrounding area, taxiways, runways, jetways etc is amazing. They even got the B-52 bomber at the B52 Memorial park at the beginning of Rwy 18L. You will love this add on scenery. One of the best works by Taxi2gate for sure. 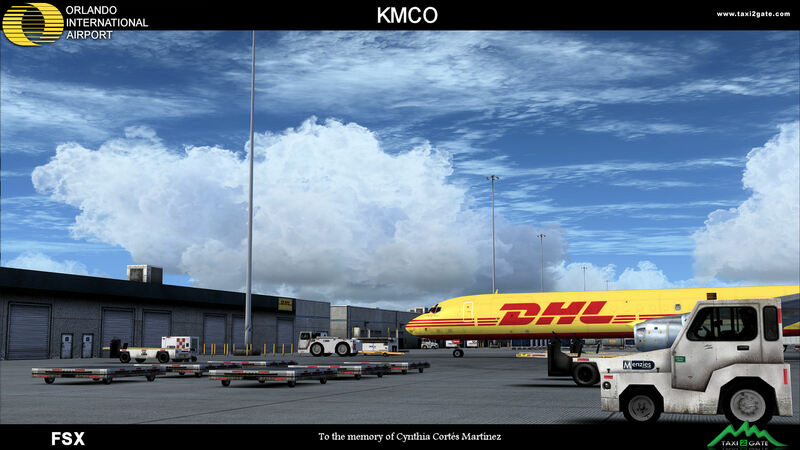 Beautiful scenery BUT when you are 10-15 miles from the airport it causes FSX to crash. 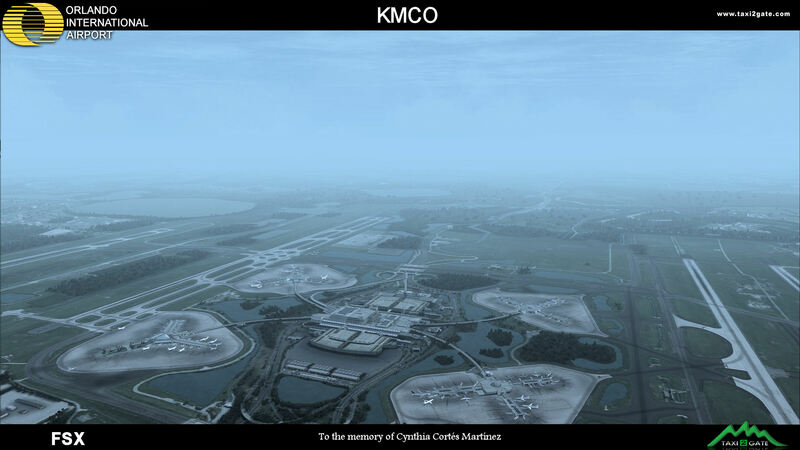 The only way I could prevent it was by uninstalling KMCO. Taxi2Gate needs to be more customer friendly and more on top of issues that can give them a bad name. hey should push updates down via Simmarket when an issue such as this one props up. Love it, I live in Orlando and obviously fly out of here a lot. This is the most detailed and accurate add on I have ever paid for. Highly recommend it. 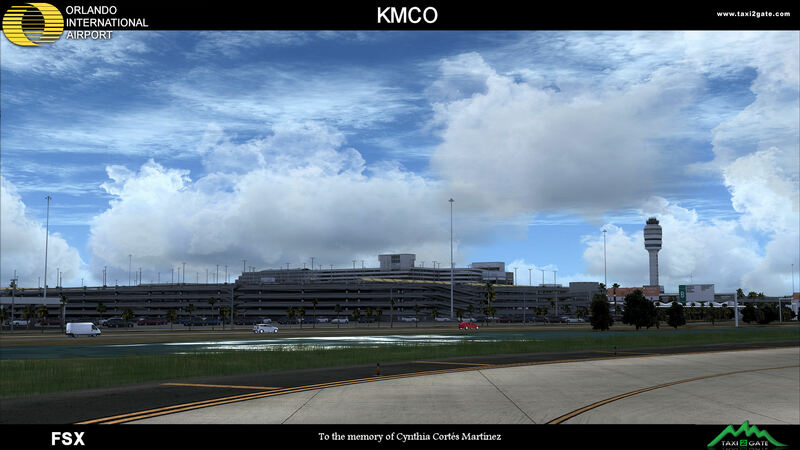 I live right next to KMCO in Orlando, and this scenery makes the airport come alive. 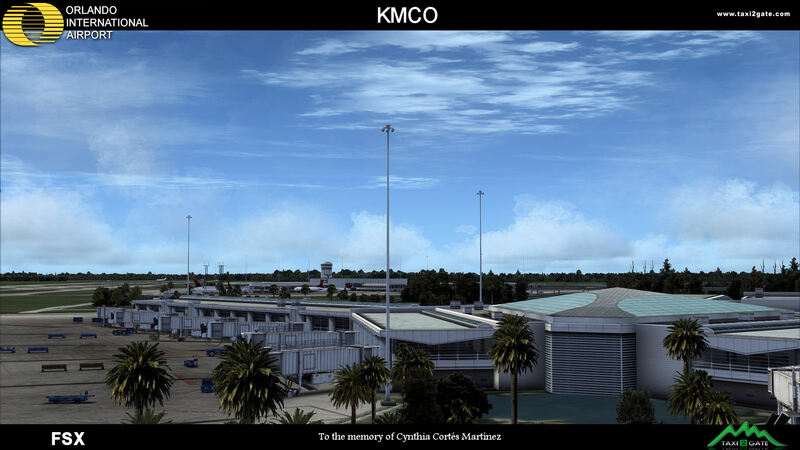 Realistic, added support and updates, all make KMCO feel real. It works well with texture replacements like REX and GEX with UTX add-ons. It is a must if you fly into Orlando, and will make you smile. I'm updating the 2014-08-23 from three stars to five starts. 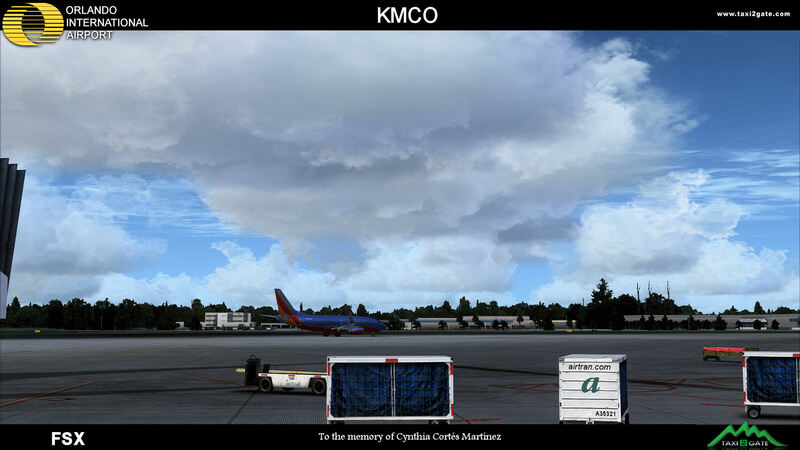 Taxi2Gate released an update in May 2015 to address the taxiway bridge issue. The fix is located on the taxi2gate.org website under the "Updates" dropdown. 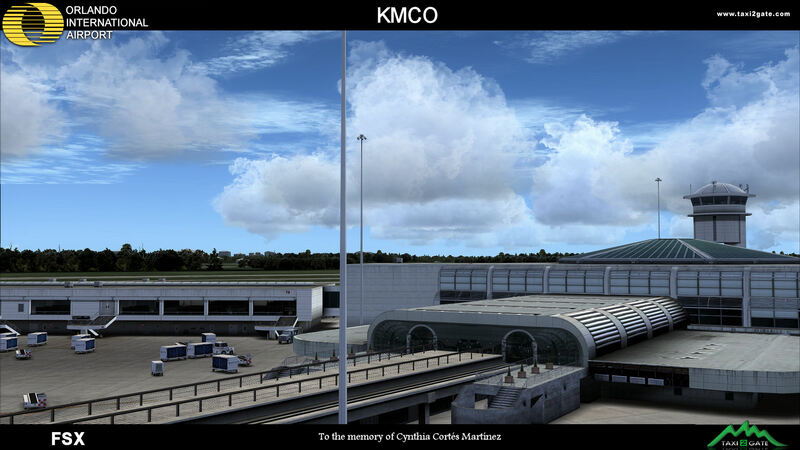 This airport looks amazing and the FPS are great - no different than before I installed it. I'm going to buy this product for every US airport they make! Thank you T2G! I'm going to agree with others talking about the taxiway bridges. Taxi2Gate really needs to fix this, especially when other developers use taxiway bridges and do not cut off AI traffic as depicted in the AFX/ADE file. They would have almost a flawless scenery if it were not for the taxiway bridges; hence I can't give it five stars until this issue is resolved. Taxi2Gate has quickly become one of the best scenery designers with the great quality of its products. 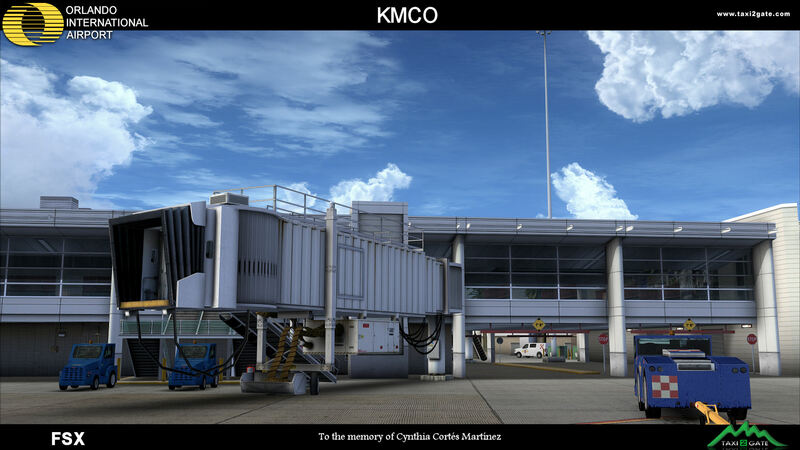 KMCO is highly detailed and FPS friendly. My only suggestion is for the developer to push updates to our Simmarket accounts, instead of posting them on their support forum. 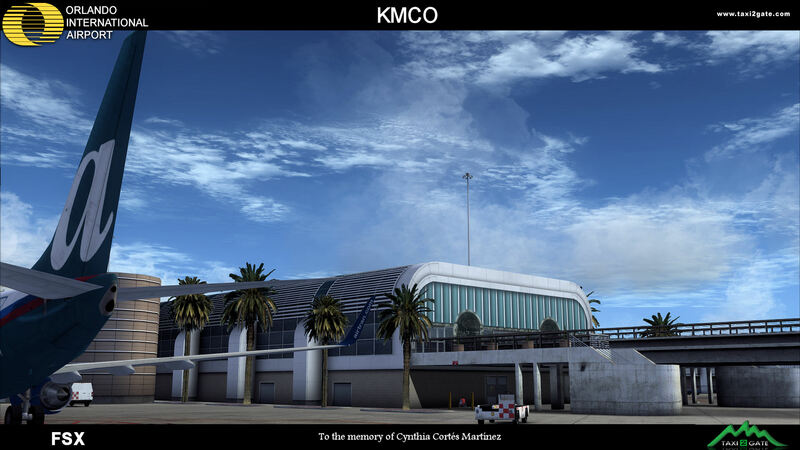 KMCO is currently on version 1.2, which like I said can only be found on their support forum. 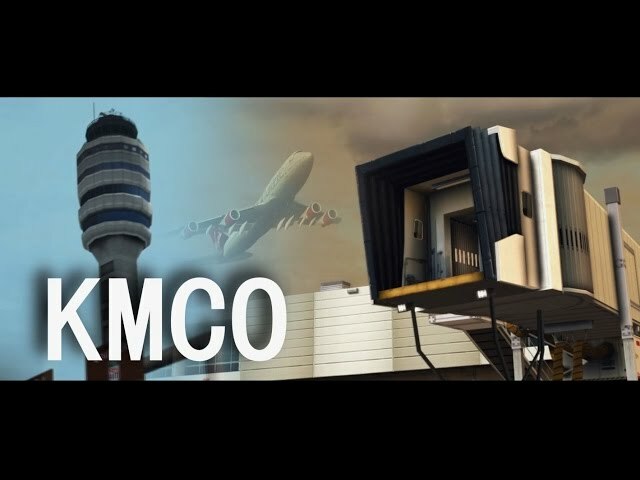 I am very impressed by Taxi2Gate KMCO. This is my second Taxi2Gate scenery and I love it. 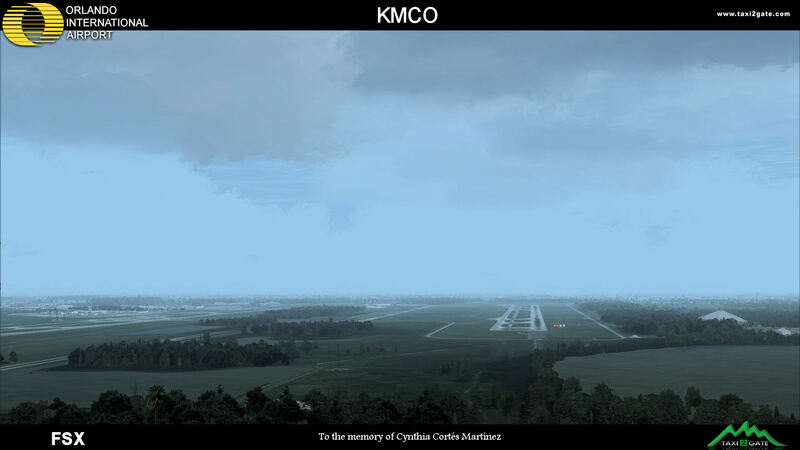 The area covering KMCO is very large and accurately depicted from other pictures I've seen. 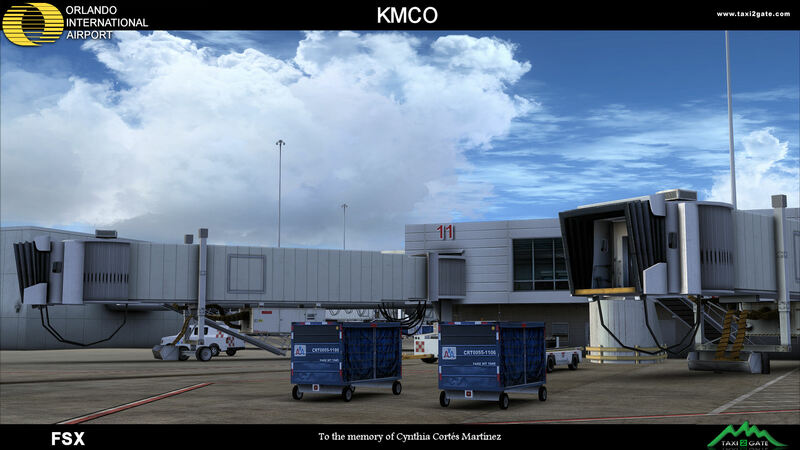 Plus I lived in FL for some years and this airport looks just like the real thing. Taxi2Gate is 100% on point with their sceneries. 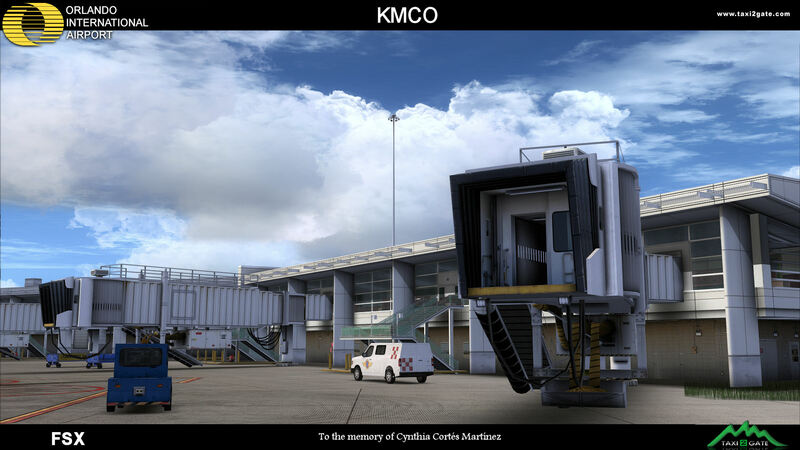 Moving vehicles, trams, and let's not forget the jetways which makes sceneries realistic! Where others fail they are raising the bar. With almost everything maxed I get 15-30 approx fps, which is good for me. 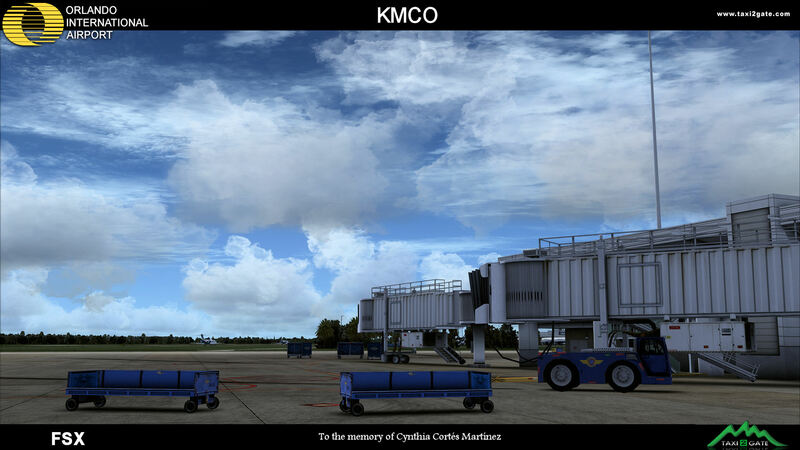 A good route to fly is KMCO to KBOS, a usually route for Delta. Taxi2Gate has a jem in this airport. The modeling, texturing, and animated touches are great. Framerates are good if you have a decent system. However, if you have AI, you're going to be having problems. Apparently, Taxi2Gate created the bridges a little different then developers like FlightBeam and FSDT do. Their bridges do not have taxi links across them.  This means that if an airplane lands and needs to cross a bridge, it will disappear. And if you try to add taxi links, it messes up the bridges' mesh and they all end up 10ft above the ground. That's the only reason why it has three stars, and the only reason I have yet to make a trip there. 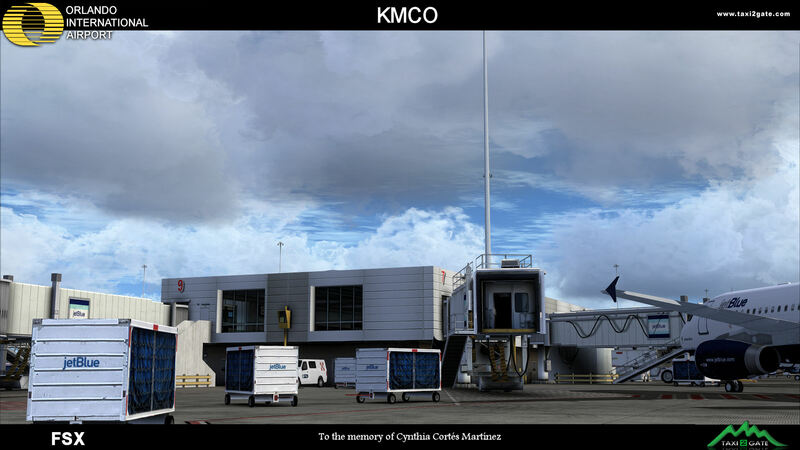 This is one of the best Airports available for FSX. A must have. What a fantastic Scenery by taxi2gate! 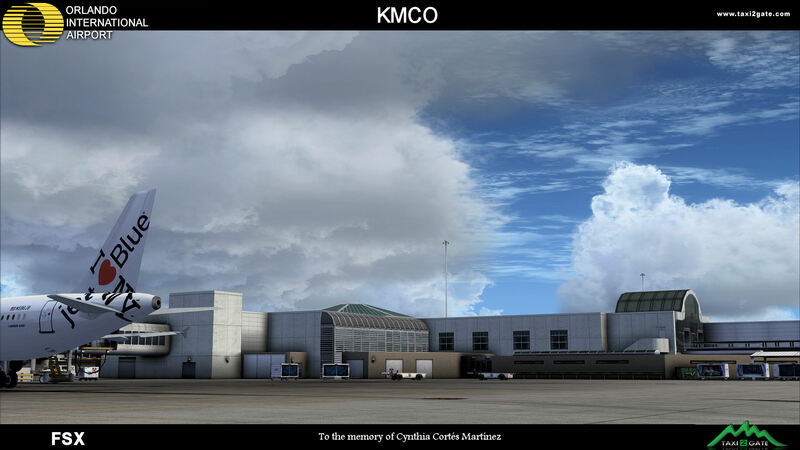 the modeling and texturing are great the modeling of the inside of the terminal is a really nice touch. 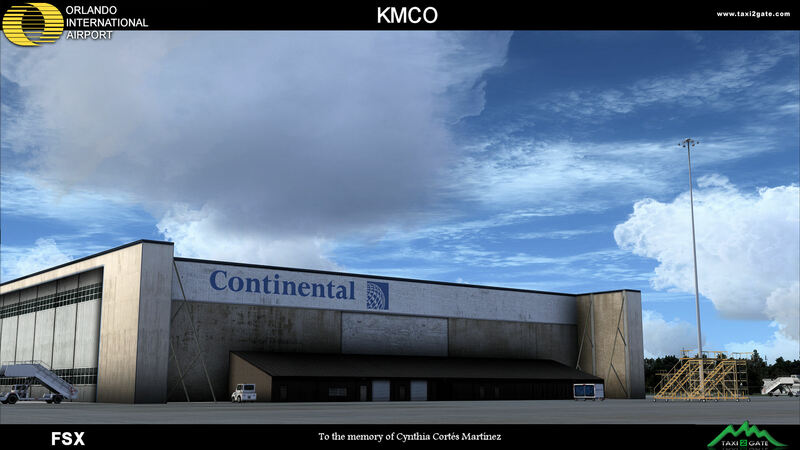 and I think is better then just having the traditional texture on it by modeling the inside it makes it more realistic as you taxi to the gate. having used this airport many times in real-life and lived in Orlando Florida, this scenery is very well made and a great recreation of the airport it also has a special meaning since the taxi2 gate team dedicated this to my wife who passed away in Orlando so a special thanks goes out to them and look forward to the many future projects don't miss this opportunity to own a really great airport and wonderful scenery for flightsim. fantastic scenery the attention to detail on the gates, the terminal building taxiways, water and everything else is nothing like i have experienced before, nice added touch with the fact you can see inside the gate waiting area would be cool with a passenger addon but that's a different story, would give it 5 star but i was disappointed to see only one of the monorail trains leaving the main terminal building and arriving at the departure gates and no train doing the return journey i know it's only a small thing but i can be picky haha and its nice to see both trains doing the journey but other than that it's a fantastic product and a must have for flight simmers, i personally can't wait to start my flights to and from taxi2gate Orlando! Very nice scenery.I have to give this one a five star. High detail and great quality.Thanks Taxi2Gate well done. Simply spectacular; congratulations to the developers. Obviously, details is where they live. Textures are top notch (on par with Fly Tampa.) Frame rates-wise, I have not noticed any decrease when compared to similar first class products. 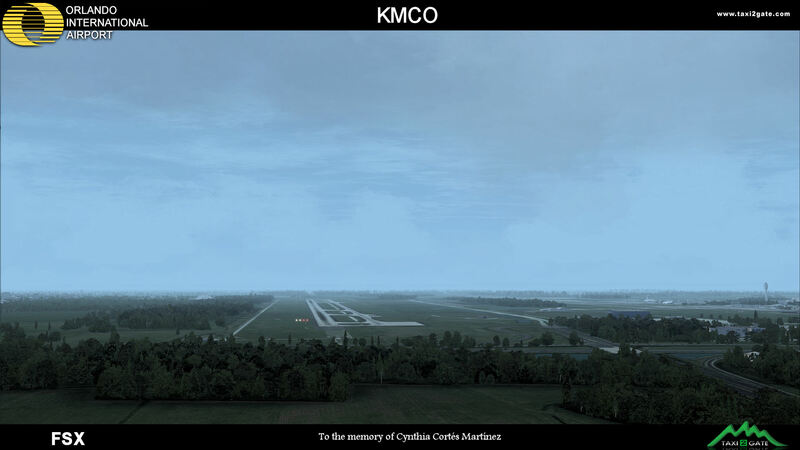 If you are looking for THE most realistic KMCO rendition out there, this scenery will definitely impress you. 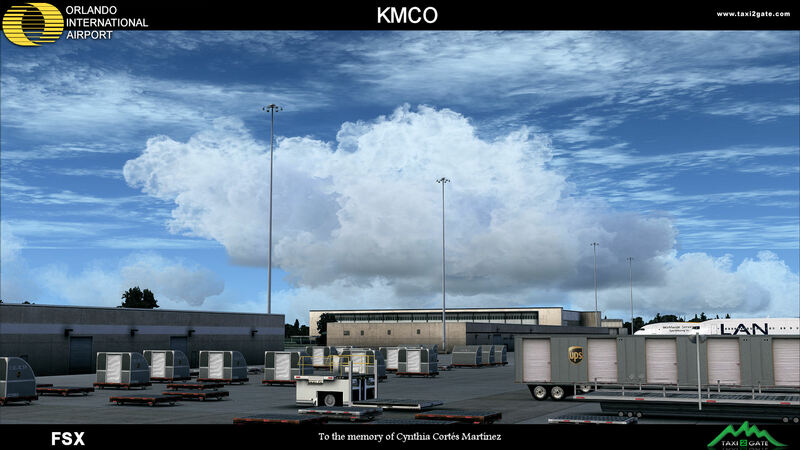 I fly out of KMCO on a regular basis and I was simply stunned the first time this scenery loaded. Thank you T2G for this gem. This scenery is great. It is very accurate. A few problems though. AFCAD file is a bit messed up but that is fixable. The united airlines gates, sign says copa airlines. The taxiway bridge that crosses the road on the north side is glitched out. Whenever planes are landing on runway 36l and 18r the dissapear a few seconds after they have landed. I would recommend at the moment to not buy it right now. There are a few glitched that some people might not like at all.If you are fine with a few glitches than buy it. I am just warning you of some of the things I did not like about it. It is still a great scenery. The textures are top class. If it was not for those few glitches it would have been a 5 star all the way. 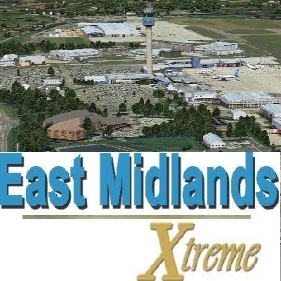 I don't 5 star ratings to just any airport. 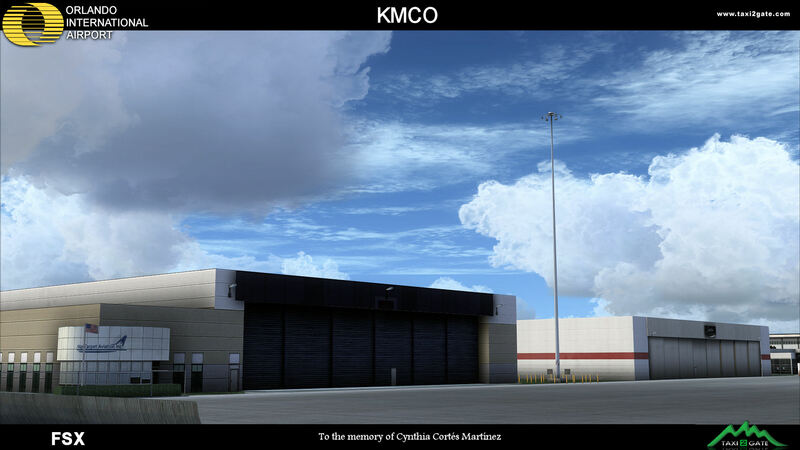 This KMCO is a work of art! Thank you Taxi2Gate. You have a customer for life. 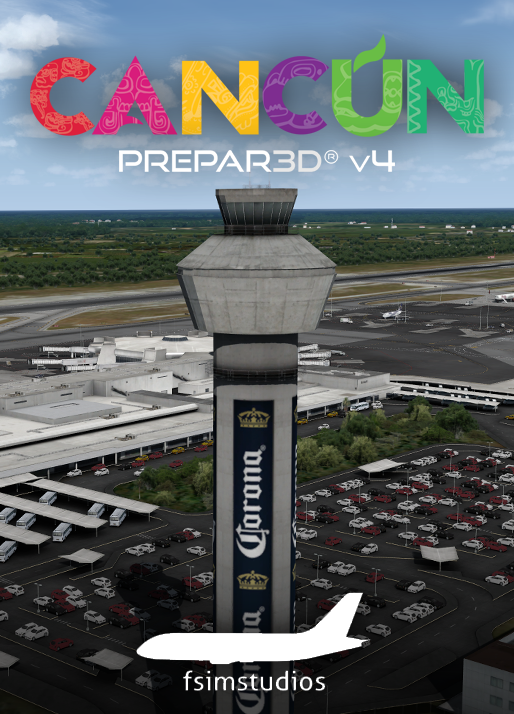 This airport looks amazing and the FPS are great - no different than before I installed it. The detail is so rich and realistic you will spend way to long just staring at various external views and the passengers will get annoyed you're not leaving already :) I'm going to buy this product for every US airport they make! Thank you T2G!